Osram is starting with a range of further LED lamp developments for the new lighting season that traditionally begins in October. At the same time, the lighting manufacturer supports the efforts of its trade partners with a renewed LED competition for consumers. For the current lighting season, Osram is launching a lamp type featuring state-of-the-art technology that looks almost identical to classic carbon filament lamps – “LED filament” is the name of the new technology where tiny LEDs are interlinked and surrounded by a glass bulb, as were incandescent filaments in previous years. All new LED Retrofit Classic from Osram comply with the demands of energy efficiency class A++, meaning they consume around 90% less energy compared to traditional incandescent bulbs, and have a 15 times longer lifespan with 15,000 hours. LED filaments feature 25 to 30 tiny LEDs configured in a line on a miniaturised PCB, and these are connected in series and surrounded by a phosphorous cast that gives the so-called filament its yellowish color. Osram technicians speak of “Chip on Cord”, based on the common “Chip on Board”. 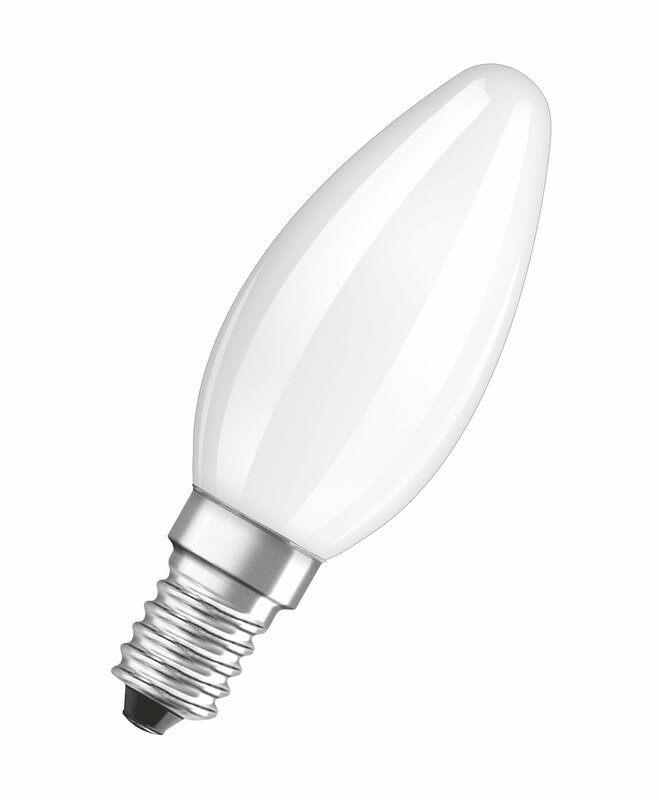 The glass bulb is filled with helium gas to protect the components, primarily the LEDs, from overheating, utilizing the chemical characteristics of helium for optimum heat dissipation. The warm white light (2,700 Kelvin) is uniformly distributed almost omnidirectionally (300 degrees), and luminous flux with between 250 lumens (the 25 watt replacement) and 806 lumens (the 60 watt replacement) is as high as its specific historical archetype. Professional and end user variants are identical with this LED lamp type – the life of 15,000 hours and 100,000 switching cycles have been determined and ensured based on intensive quality testing. The period of warranty for both versions is two years and the color rendering index (CRI/Ra) is 80. Eleven versions of the LED filament lamp from Osram have been available since October 1, in the classic shape as well as drop and candle forms. The 60 watt replacement lamps will be available from January. 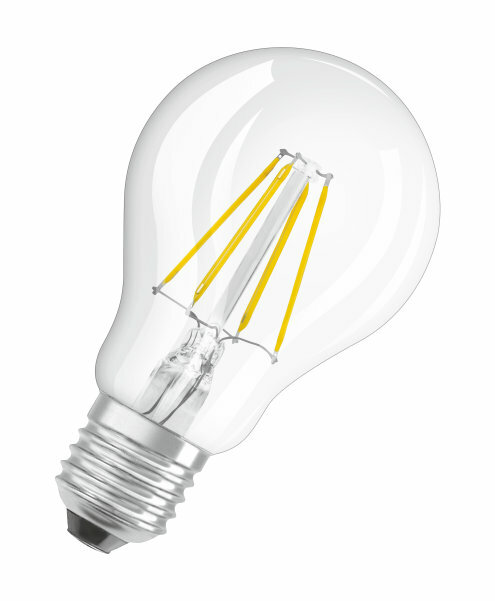 All LED filament versions have a clear glass bulb to emphasize their decorative aspect. In precisely the same construction size as the traditional incandescent bulb, the LED Star Classic A and dimmable Superstar Classic A are now available in matt versions as 40 watt replacements. To achieve the right dimensions for this LED retrofit lamp, the heat sink has been significantly reduced in size. Matt equivalents are also now available for the candle and drop-shaped bulbs, and these now completely do without a heat sink, meaning that on the outside they appear exactly the same as their historic predecessors. This makes replacing standard incandescent bulbs even simpler, even in decorative applications. Osram has also developed an LED equivalence product for halogen reflector lamps often used in the decorative sector. The glass LED reflector lamps with GU10 base completely replace the conventional 35 watt (230 lumen) or 50 watt (345 lumens) lamps that are no longer permitted to be brought to market from September 2016, in accordance with the latest EU regulation. The LED reflector lamps generate their 230 lumens with just 3.2 watts and 345 lumens with just 5.3 watts of power consumption. Attractive prizes can be won again this year in six European countries (Norway, Germany, Austria, France, Italy and Sweden) for purchasers of the specifically most common lamp types – the promotional blister packagings contain country-specific winning codes. If a code is entered on a specific internet page but does not immediately win, there is still a second chance in the large online raffle, where five knowledge questions about LED lamps must first be answered. Prizes include LED product packages to a total value of over 150,000 euros. All common lighting applications in domestic environments can now be covered by Osram LED lamps.